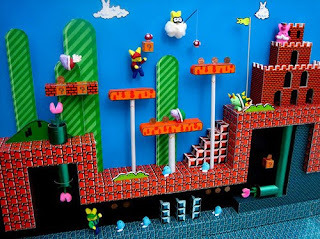 The Gay Gamer: Super Peepio Bros.
For the last four years, the Washington Post has held a "Peeps Diorama Contest" in the run up to Easter. This year's contest drew more than 1,100 entries, with Mark Rivetti's "Super Peepio Bros." creation (below) earning a semifinal berth. According to the Washington, D.C.-based newspaper, it took Rivetti approximately 45 hours to create the diorama above, with all of the characters being crafted from chick or bunny Peeps. Also, take note of the Peep shapes included in the clouds and platforms. Labels: Easter, mario, Peeps, random, Super Peepio Bros. FIANLLY!!! A use for Peeps! Now can they stop labeling them as edible and start peddling them as sculpting material? Ditto. Have you tried the orange ones? Yum!